UPDATE: News for Wal-Mart Express: smaller format may help Walmart combat 2-year same-store sales declines. A First Look at Walmart Express. Wal-Mart Stores Inc.'s first convenience store-sized Walmart Express opened in Gentry, AR and offers a peek at how the world's largest retailer plans to expand in big cities and small towns. As the supply chain expert in retail, Walmart will be a formidable competitor to C-Store chains such as 7-Eleven and WaWa. Read the latest A First Look at Walmart Express. Wal-Mart plans to open its first Wal-Mart Express Stores. Walmart Is Creating Express Stores to Solve Shoppers Convenience Gap. Guess that means size does matter? Well, not the way you think! Wal-Mart Stores Inc. plans to open its first Wal-Mart Express store on Chicago's South Side. They are also rolling out the "Express" store format in their backyard, Prairie Grove, Gravette, and Gentry, Arkansas. Wal-Mart is experiencing what we call a "convenience gap"… the stores are huge and when we humorously relate to "size matters" in Wal-Mart's case, the mass merchant size, your typical Wal-Mart or Supercenter size (the combo Wal-Mart + supermarket), ranging from 100,000 sq ft to over 150,000 sq. ft. pushes them to locating in areas that are not very convenient to get to. Wal-Mart is in a major slump, reported The Wall Street Journal. It tried to compete with Targets "cheap-chic" instead of focusing on its core value to the consumer: Every Day Low Prices. Even their arch-rival Target will open small-format stores in Chicago with a grand kickoff in the Windy City. Wal-Mart can't catch a break! Wal-Mart lost focus on its core customer bases… U.S. households earning less than $70,000 a year—which made up 68% of its domestic business. Food is everywhere, and strong competitors are dollar stores, box stores such as Aldi and drugstores such as CVS and Walgreens. In fact, Walgreens is relocating legacy stores to new retail locations to accommodate their new emphasis on food and fresh foods. Customer Growth Partners published some new research that is illustrating trends that point to growth in smaller format stores. We don't need research to tell us that we are changing our shopping behavior as we become more "time-starved." The food industry looks at our shopping trips in two ways. "Pantry-loading" is where we spend over an hour shopping stocking up on foods that are on sale at great deals, like the "10 for $10" promotions we all have seen. CVS, Walgreens ,and Dollar stores are merchandising more foods to appeal to what the food industry calls "fill-in trips"… running into a store and grabbing a few items on our way home from home from work. A new term, "Mission Shoppers" go out with a very tight list, ignoring impulse purchases and only focusing on a few items they want to buy. Crain's Real Estate Daily explains that a Wal-Mart Express store will be a 10,000-square-foot store located, with having a focus on food, will be near a 150,000-square-foot Walmart Supercenter, just a few blocks way. The food industry is not too surprised by the Wal-Mart Express announcement since the company has been experimenting with smaller footprint stores for several years with Neighborhood Market by Wal-Mart and Marketside by Wal-Mart. Neighborhood Market stores are approximately 40,000 square feet and have been around for over 12 years. The stores focus on food, have a more upscale look and can be located easier due to their sub 100,000 square foot size. Notice the primary focus is on food and a more convenient size. UPDATE – Walmart Express is the latest push by Walmart to dominate the small footprint retail segment. 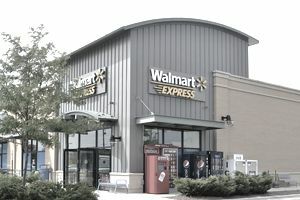 Read Wal-Mart Express – First of Walmarts expansion in Chicago in an attempt to compete with Trader Joes and Fresh N Easy. Again the focus is on food, meal solutions, and the size allows Wal-Mart to have a laser-like focus on convenience. Walmart Express was derived from their experimental Marketside concept which was more of a proof of concept, sort of a sandbox for Wal-Mart to experiment in the small footprint arena. Walmart is shifting emphasis away from its sprawling Supercenters to smaller stores to reverse a decline in U.S. sales at stores that have been open for at least a year, a key metric of retail health. So, if you are a food entrepreneur starting or running a food business, why should you care? You're not thinking of selling to Wal-Mart. I am not telling you to run off to Bentonville to make a new product presentation for the new Wal-Mart Express stores. My guess is they create the new Express assortment from their current merchandising assortment. Wal-Mart Express is an indication of a Meta-Trend, trends that have far-reaching effects for consumers and the market. Smaller footprint stores are easier to locate, require less investment and can target a smaller group of consumers. There is less risk. Other retailers recognize this and may follow suit, which means there will be more points of distribution available for more products. Price. The consumer will forgo some convenience for great prices. Convenience. The consumer weighs time, the cost of fuel, and immediacy of their needs vs. price and decides the former have a bit more value. Other. These are retailers that focus on Affordable Indulgence, Health, and Wellness, Specialty Foods, Gourmet, etc. On the journey from kitchen to shelf to consumer's plate, consider designing your products to address one of these 3 channels of distribution for great success in starting or running your food business.